Enter the number of pixels or use the arrows to increase/decrease the line width. If you'd prefer to use multiple outlines, choose a style from the drop-down. 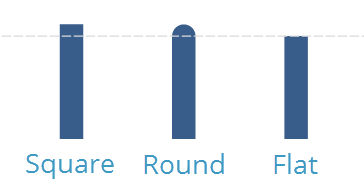 To create a dashed line, choose a style from the drop-down. Choose a style for line endings. Flat means no caps are added to lines. Square and Round each add a cap shape. For example, here are three lines of identical length, each with a different cap type. Choose how lines should look when they intersect: rounded, beveled, or mitered. For example, here’s what each join style looks like on the corners of a square. 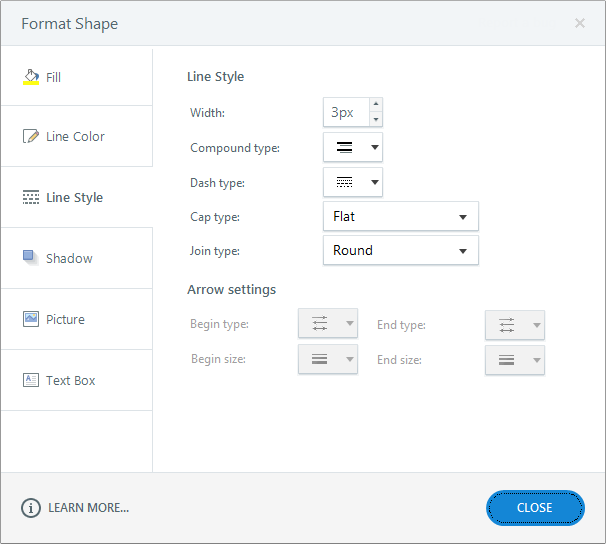 To add arrows to the ends of a line, choose a style from the Begin type and End type drop-downs, then select a size from the Begin size and End size drop-downs.